In this blog post, I’ll show you how to create an runnable JAR file. This will use the code from video 12.10. A runnable JAR file allows you to have a single JAR file that includes all Java class files and supporting libraries. In our case, this includes the JAR files for the MySQL JDBC driver (client api code only) and the JAR file for the GUI library JGoodies. Once the JAR file is created, then you’ll be able to double-click the JAR file in the file manager and the application will start. Note: the export will finish with warnings. You can safely ignore them. You can run the program using your Windows Explorer or Mac Finder. Double-click the file and it should run and connect to your database. If you have problems then you should run from command-line to see details of the stacktrace. View the stacktrace and it will tell you what the problem is. Hi All, Things have being going good with the JDBC Swing GUI video series. I had a YouTube subscriber ask if I could expand on this example and show how to handle dates. So, in this post, we’ll add support for read/write the date of birth for an employee. 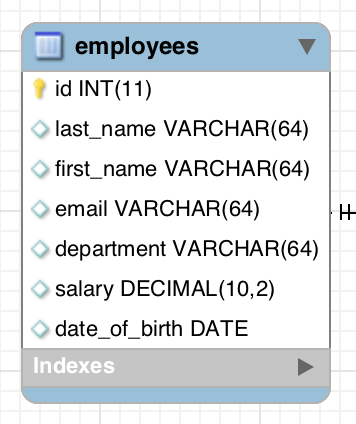 We need to add a new database field for Date or Birth. Here’s the updated SQL for the Employee table. We need to add a new field for the Date of Birth field. This field will make use a formatting to make sure the user can only enter numbers for the date. Also, when they attempt to save, we will validate the date field. Here’s a screen shot of the GUI. Notice the new Date of Birth field. 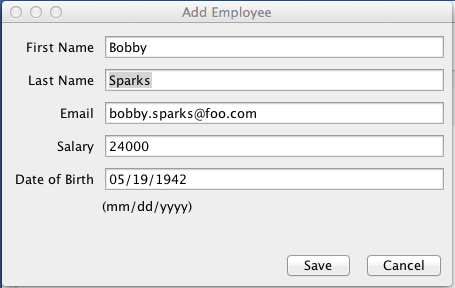 When the user enters the date and selects Save, we need to retrieve the date and set it on the employee object. When we read the date, it is initially a String. We need to convert it to a date object. If the String is an invalid date then this will throw an exception. We can inform the user of the invalid date. Finally, in our DAO code, we need to add code to read and write the new date of birth field. Here’s the snippet for inserting the date into the database. myStmt = myConn.prepareStatement("insert into employees"
+ " (first_name, last_name, email, salary, date_of_birth)"
Now, here’s the code for reading the date field. In this post, I wanted to highlight the major changes. I made additional changes to the app such as adding the date field in the Employee class and updating the code in the EmployeeTableModel. You can download the code and review all of those changes. Just search for “dateOfBirth” in the source files. In this video we will learn how to connect a Java GUI to a MySQL database. We will add support to check a user’s password during login. Note: All initial passwords are set to: java <--(all lower-case) Please SUBSCRIBE to my YouTube channel.